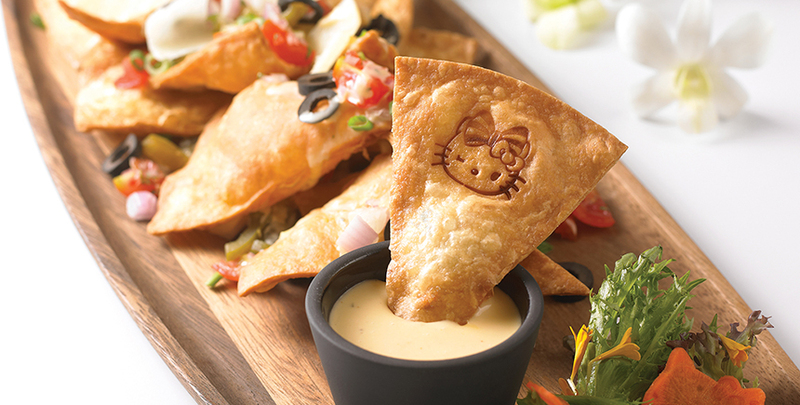 Fans of the famous feline will be purr-fectly pleased to hear that Singapore’s first Hello Kitty café (also the first 24-hour Hello Kitty café in the world) has opened its doors at Changi’s Terminal 3’s Arrivals Hall. We’re relieved to see that while the café boasts many colorful motifs of the iconic mouthless cat, it isn’t decked out entirely in pink. Instead, its interiors feature plenty of orchid accents — a tribute to Singapore’s national flower. Other design elements include wrought iron swing seats, colonial-style windows, and plenty of wood, all of which channel a rustic, idyllic vibe. The food won’t disappoint as well, with all-day breakfast fare like waffles, pastries, teacakes and gelato sundaes. Local and Asian influences have been woven into the menu, so you can sink your teeth into unique fusion dishes (with inventive names to boot!) like the Cowabunga! Wagyu! (S$24) — fork-tender wagyu imbued with the rich flavor of pineapple rempah, and served alongside Japanese rice packed in the likeness of Hello Kitty. Then, round up your meal with desserts such as Rose, Rose I Love You ($17.50) — a moist orange sugee cake masquerading as a potted bloom, complete with crunchy chocolate “soil” and petals of strawberry buttercream. Of course, don’t forget to take home a Hello Kitty souvenir from the café’s retail space before leaving, such as a limited-edition plushie (only 500 pieces are available! ), postcard or cup. Now that’s one more compelling reason to visit Singapore!